The reflection coefficients of a nanoparticle film are driven to a large extent by perpendicular and parallel interfacial susceptibilities that have the meaning of “dielectric thicknesses” which combine the actual geometry of the film and its dielectric properties. The direct determination of these parameters faces the long-standing issue of the derivation of complex optical constants from Fresnel coefficients via a unique spectroscopic measurement. The present work sets up an iterative algorithm based on inversion of the reflection coefficients recorded in the UV–visible range for two polarization states s and p and Kramers–Kronig (KK) analysis. To calculate the KK integrals over a limited energy window, the strategy was to complement measurements by spectra calculated in the framework of the spheroidal dipole approximation. The algorithm has been successfully tested on synthetic data of differential reflectivity for supported truncated spheres. These were chosen to span different dielectric behaviors, involving (a) for the particles, metals whose optical response is dominated by plasmonic excitations with a noticeable Drude behavior (Ag and Au) and (b) for the substrate, either nonabsorbing wide bandgap (alumina) or semiconducting (zincite and titania) oxides. 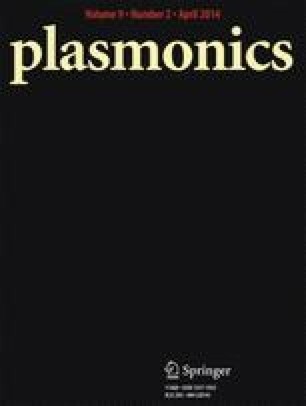 Unlike the thin plate model, the approach was proven to apply to “dielectric thicknesses” of several tens of nanometres in cases in which, even for geometric sizes of the order of the nanometer, the classical long-wavelength dielectric approximation fails because of strong plasmon resonances. Therefore, the disentanglement of dielectric behaviors along the parallel and perpendicular directions simplifies the understanding on the interface polarization process by removing substrate contribution. The present work that deals with plasmonics in nanoparticles can be easily generalized to different morphologies as well as to other combinations of Fresnel coefficients. This work has been funded by Agence Nationale de la Recherche (ANR) (Program “Matériaux et Procédés pour des Produits Performants” contract ANR-2011-RMNP-010, COCOTRANS) and has benefited from a mobility grant AURORA between France and Norway. The aim of this appendix is to recall the expressions of the supported spheroid depolarization factors which are used as starting point of the inversion algorithm of SDRS. The geometry will be restricted to an oblate spheroid as it better describes the experimental particle flattening. Electrostatic interactions, both with the substrate and between particles, are kept at dipolar order for the sake of simplicity. Particles are ordered on a lattice of parameter L. Anyhow, equations for prolate case and up to the quadrupolar order can be easily found in the literature . All the geometrical parameters are defined in the text and in Fig. 1.
where \(\rho \) is the number of particles per surface unit.